There is no such thing as perfect objectivity when it comes to knowing ourselves. We have to rely on feedback from others, whether solicited, unsolicited, or even unwanted. And actually, this is a pretty natural learning technique. Think about very young children – how do they know that the things they do or say are funny, wonderful, new, interesting… Because the grownups around them laugh, applaud, or scold. As we get older, the cues we get are much less obvious and unless we are very self-aware, we’ll miss them. 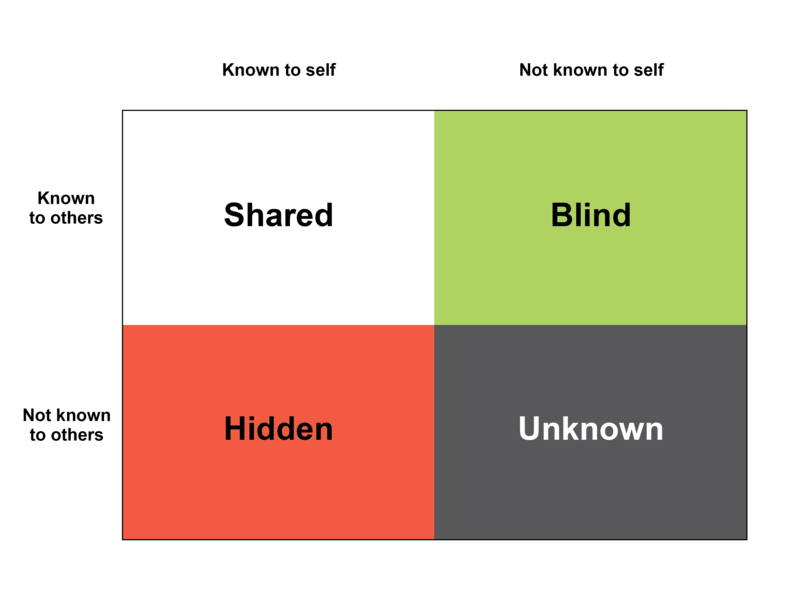 Psychologists Joseph Luft and Harry Ingham explain this through a model called the The Johari Window. It represents information — feelings, experience, views, attitudes, skills, intentions, and motivations — within or about a person. It looks at the information from four perspectives: open, hidden, blind, and unknown. The degree to which we share ourselves with others (disclosure) is the degree to which we can be known. In the Open/Shared area, people recognize us for the things we also know about ourselves consciously. We move within this area with freedom and ease, comfortable that our actions and words are in alignment with what people expect from us. The Hidden area contains those things we usually don’t share, and when we do, it is a deliberate choice, which we make only occasionally or with a select few people. The Unknown area contains those rich and complex elements that make us mysterious and interesting human beings. Neither we nor others are aware of these on a conscious level. Sometimes something from this unconscious area is revealed – we might dream or read or feel something that proves insightful to us or others. Why is it important to limit our blind sides, what is unknown to us? Without the protection of awareness, we’re walking around vulnerable, acting in ways that might not serve our goals or best interests. We cannot move with confidence and are forced to react rather than make the plays we really want. We might even get hurt. To know yourself and minimize your blind spot, solicit feedback regularly from people you trust to be honest with you. Global corporate communication, business, and organization behavior executive; author. My blog, DesigningCommunication, offers inspiration, insight, and tips for all professionals who want to express themselves effectively, and lead with integrity.